(Bloomberg) -- Japanese investors are powering this year’s U.S. corporate bond rally. Money managers in Asia are binging on blue chip American company debt after having cut back late last year. A measure of overseas buying in 2019 has more than doubled from a year earlier, according to Bank of America Corp. Japanese purchases of foreign debt, including U.S. corporate bonds, are off to their strongest start since 2012, according to the bank. Overseas investors including Europeans are getting pushed into U.S. investment-grade corporate debt by low returns at home as central banks globally cut growth forecasts, including the Federal Reserve on Wednesday. 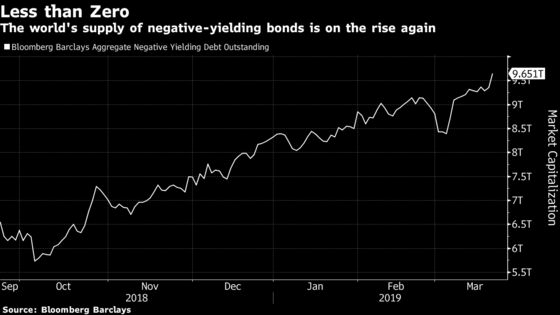 About $9.7 trillion of debt worldwide now has negative yields, a figure that’s jumped by more than 60 percent since October, according to Bloomberg Barclays index data. Foreign buying has helped U.S. corporate bonds have their best start to a year since 2001, and is spurring at least some strategists to make their forecasts for 2019 for the bonds more bullish for risk premiums, or spreads. Among those foreign investors, the Japanese stand out. Money managers from the nation have bought $52 billion of foreign securities this year through March 8, compared with sales of $6 billion and $33 billion for the same periods in 2018 and 2017 respectively, according to Bank of America. That’s the most since 2012, and much of it has gone into U.S. corporates, said Hans Mikkelsen, who leads investment-grade company bond strategy at the lender. “When you look at the U.S. corporate bond markets, there’s no doubt that Japan is probably the biggest country -- the most important country -- in terms of foreign buying,” Mikkelsen said. To accommodate foreign demand, some issuers in recent years have started announcing bond sales during the morning in Asia or Europe, allowing underwriters to build an order book before U.S. money managers have come in, said Todd Mahoney, head of fixed income syndicate for the Americas at UBS Group AG. Bond yields are dropping globally as investors grow more fearful about trade wars and protectionism, and economic expansion shows signs of slowing. The Fed’s signaling in January that it was taking a break on rate hikes helped goad U.S. and foreign investors to buy corporate debt again. The Fed’s lower growth forecasts this week followed similar scale-downs from China and Europe this month. Relatively low yields in Japan and Europe make the higher yields on dollar-denominated bonds more attractive, while slowing growth in the U.S. cuts hedging costs. The average U.S. investment-grade bond yields around 3.8 percent. After hedging currency, Japanese investors can earn a yield of about 1.06 percent on high-grade American corporate debt, according to a report from JPMorgan Chase analysts March 15. That’s substantially more than, say, 30-year Japanese government bonds yielding around 0.53 percent. 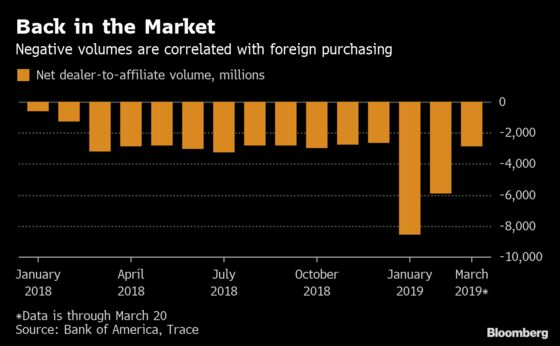 One place that demand shows up is in net buying by U.S. dealers’ foreign affiliates on Trace, which is correlated with overseas demand even if it doesn’t represent all of that activity, according to Bank of America. That figure has more than doubled this year compared with the same period in 2018. Dealer inventories have fallen close to multiyear lows for corporate bonds maturing in between 1 and 10 years, which often results in spreads tightening in the coming weeks, Barclays strategists wrote on Friday. Japanese investors aren’t just purchasing investment-grade corporate debt. They’ve been key buyers of bundled U.S. leveraged loans known as collateralized debt obligations, where they tend to focus on top-rated securities. Not all strategists at banks are as bullish. In early February, Citigroup recommended investors cut their investment-grade corporate bond holdings, citing factors including U.S.-China trade negotiations. There are signs that foreign interest in U.S. investment-grade debt may have waned over the last week or so. Dealers have been net overnight buyers of U.S. company bonds on more occasions in recent weeks, which can signal that investors overseas may be selling some of their holdings. And for European buyers, U.S. corporate debt can yield less than euro denominated securities after hedging, JPMorgan strategists found. With lower U.S. Treasury yields and tighter spreads it may make sense for some money managers to take profits, according to JPMorgan. Money managers may have been taking profits for the last few weeks, potentially around the end of the fiscal year in Japan, said Chris Alwine, head of global credit at Vanguard Group, which oversees $725 billion of actively managed fixed-income assets. “We don’t expect that to continue,” Alwine said, noting that many foreign investors still get higher yields in the U.S. than they do domestically. Foreign purchasing could be consistent in 2019, even if it slows from the the rate of the last few months, he said. Buying could rev up next month. Around 75 percent of buying in the region tends to take place in the six months starting April 1, with the new Japanese fiscal year, Bank of America’s Mikkelsen wrote in a report. At the end of calendar 2018, Japanese demand waned amid fears the Fed would keep hiking, which helped push U.S. corporate bond spreads wider. Bank of America last week cut its forecast spreads for the end of the year for investment-grade bonds by about 0.25 percentage points, to a level equivalent to around 1.15 percentage points for the Bloomberg Barclays U.S. Corporate Bond index. That level stood at 1.18 percentage points on Thursday, and total returns for the index were 4 percent. UBS’s Mahoney said he’s been seeing Asian demand picking up.